The client is a design-build company that specializes in custom retail solutions like branded foodservice equipment & displays. Known for their innovative designs and amazing graphics, the client provides integrated solution for interior engineering projects. Based out of Franklin, Massachusetts, the client has over two decades of experience in providing design integration, engineering, manufacturing, project management and implementation. With a growing customer base, the client is quite apt in providing graphical and industrial designs. An expert in modular kitchen and store systems, the client is a preferred service provider for small, medium, and large projects. The client has been providing interior and space management solutions to its growing list of clientele. 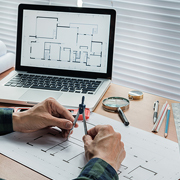 For one of their turnkey projects involving interior design support for over 2100 hotels, the client was looking for an experienced partner to remodel the kitchen to accommodate new standards. The assignment involved remodeling the kitchens with inputs that were in the form of photographs of the existing state. The inputs also included measurements of the kitchen equipment as well as fixed and unmovable structures along with the height of the wall and details of the counters. The challenges involved modeling the kitchen to fit the latest equipment while ensuring their models followed three standard layouts that were decided to be used in all hotels to make the design consistent and practical. With the completion of the project, O2I furnished kitchen models which were consistent with the latest standards. The three standard layouts followed by most hotels were used effectively to design models in a cost-efficient way. It proved to be a success where we could remodel the kitchen easily accommodating latest equipment. The client was overwhelmingly happy with the substantial benefits and proclaimed to outsource future requirements to us. The SketchUp modeling team at Outsource2india comprises of civil engineers, interior designers, and project managers with decades of combined experience. Over the last two decades, we have successfully served various clients that include architects, construction developers, real estate developers, filmmakers, civil engineers, video game developers, and product designers. Contact us today to understand how SketchUp modeling can add value to your dream project and get a free quote in 24 hours.